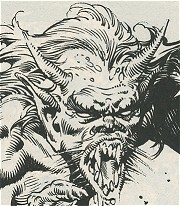 Powers/Abilities: Bellil was at least 10 feet tall, covered by fur and had sharp teeth and horns. He had only four fingers per hand. He seemed far stronger than a human, he could shatter solid rock with ease, but he didn't show any magic power. (Savage Sword of Conan#114/1 (fb)) - In an era, when men were savages and volcanoes existed instead of realms, a falling star attracted the attention of some men of good will and they found the Demuzaar, a mask shining of light. Those men used the mask against beasts and evil men. The evil men were horrified by the Demuzaar, its light sent them to Khaa. There, Bellil and his demons tortured them burning and tearing their flesh, banqueting with their limbs, causing them starvation and agony. The Demuzaar was hidden in a valley which, after a millenium, became the region of the Black River. A volcano erupted hiding the Demuzaar, and the door to Khaa. (Savage Sword of Conan#114/1 (fb) - BTS) - A Cimmerian named Conan found the Demuzaar and entered the realm of Khaa where Bellil and his demons assaulted him. Conan managed to get back to Earth, but the shock of the journey to the nether realm, deprived him of the memory. (Savage Sword of Conan#114/1) - Some days later, Bellil happily saw Conan again in his realm. He sent his demons to seize him, but the Cimmerian regained his lost memories and fought them with a deadly rage, slashing and keeping them at bay. Bellil intervened and smacked the barbarian, laughing at him. 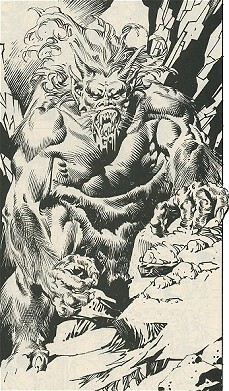 Conan managed to strike him with a rock and jumped in the dark maw which returned him to the hidden caves of the Demuzaar. (Savage Sword of Conan#114/1 - BTS) - Few days later, Bellil received the visit of King Jumel and his men, transported there by the Demuzaar used by Yasul. The demons tortured them, but Bellil swore revenge against Conan. He'd find other portals! Comments: Created by Larry Yakata (writer), Rudy Nebres (art), Larry Hama (editor). The fallen star which signaled to the savage men the position of the Demuzaar, could be the Demuzaar itself. Adding the fact that Bellil and his demons lived in a nether realm, the Demuzaar could be the portal left by the demon Bellil to lure men to Khaa. Or better, the star was Bellil, whose fall created the nether reaches of Khaa, and the Demuzaar was his mask. All this resembles the story of Lucifer. So, Bellil could be a being from another planet, or simply from another dimension, and he could be alive from before the Hyborian Era. or any other "Bel" character. 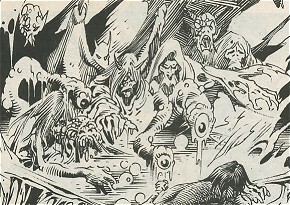 The Demons of Khaa were horrible to look at. They had various shapes: humanoid, beast-like, insect-like. Some of them had bat-wings and could fly, others crawled, others had horns, some were one-eyed. The most part of them had sharp teeth and claws. Their physical strength wasn't superior to a Cimmerian's. Some of them were evil men who embraced Khaa and were transformed into demons. They lived in a rocky, scarred world, which stench recalled starvation and blood. Stains of blood or fire contained bodies in agony and scream.